Skip $695 Skyclub membership – Join Alaska Board Room for $450 w/2 FREE GUESTS! Delta may not have thought this latest Skyclub change through. I mean, they have upset just about everyone who flies with a +1 and anyone who has a Delta Reserve card or a Platinum Membership Rewards card personal or business with the latest move to charge $29 for guests starting 1MAY this year. With a HT to reader Jack, we may have a workaround! For just $450 we can join the Alaska Board Room and get access to the Skyclubs when flying on an Alaska OR Delta ticket. Oh, and btw, YOU CAN BRING TWO GUESTS or your FAMILY for FREE! And they have a 7,500 bonus mile offer as well until 31JAN. On top of that, and I know you are going to say this can change, but you can get 3 years of membership for only a little more than the 1 year membership with Delta and I don’t see how Alaska can change the rules as you are signing up under the current terms and conditions! ← Rookie Wednesday: Searching for more than 1 seat can COST YOU on Delta.com! This makes a bet on the, couch, stability of the Delta-Alaska relationship. Of course one school of thought has Delta making Alaska cry uncle until they agree to be purchased. On the other hand, Delta’s game of chicken with their partner in Seattle could well push them into the arms of the Eskimo’s other partner from Dallas. And you could find yourself with 3 years of AAccess to AAnother club. @Gary – get out the popcorn and enjoy the show! Txs for your thoughts as always. Will this count as MQD spend 😉 ? I know it will count as spend on my Delta Reserve card and therefore earn me miles and eventual MQM. Maybe this means Delta will bring back the good beer? It’s not a bad idea, but nothing is guaranteed as far as continued SC access. You should read the current terms and conditions, which include the following: “Alaska Airlines reserves the right to restrict, alter, and/or modify the fees, benefits, services, and club room locations and hours at any time with or without written notice to its members.” I think Alaska is a great airline with a great product, and is certainly currently offering a much better value proposition for club membership than Delta is, but I wouldn’t suggest to your readers that it’s guaranteed to stay that way if they buy now. @Sam @Eric – As many have pointed out, one would expect a clearly published perk would not just get tossed to the side without some kind of rebate or credit. Also, Alaska had not shown itself to be a harsh as Delta when it comes to changes and showing the appreciate flyers. So far anyway. Look at it this way, for one year, it is a much better value hands down. 3 year, I agree it is a risk but the cost is STILL not much more than 1 year with Delta right now! 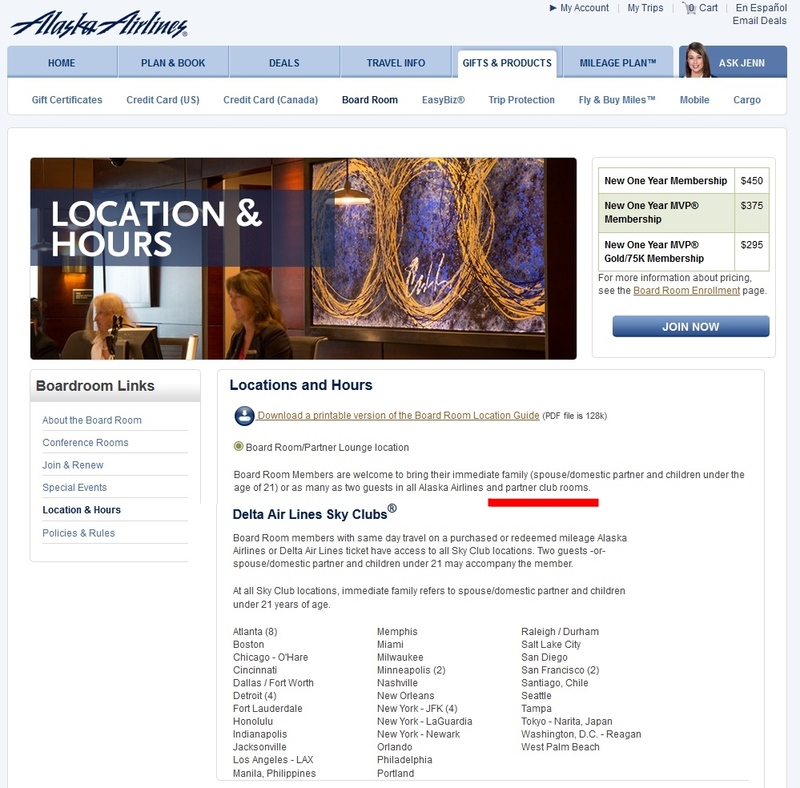 Delta is making no changes to those with existing Sky Club memberships through the existing membership term and I would expect that the Alaska Airlines Board Room membership would be the same, but there’s a risk. After all Amex Platinum benefits are changing, so don’t be surprised if there’s a new pricing structure to reflect the added cost of guest privileges at Delta clubs for AS Board Room members. While Alaska appears to be a fine airline (flew the twice last year as a DL codeshare returning from China), it is not much use to those of us east of the Rockies. 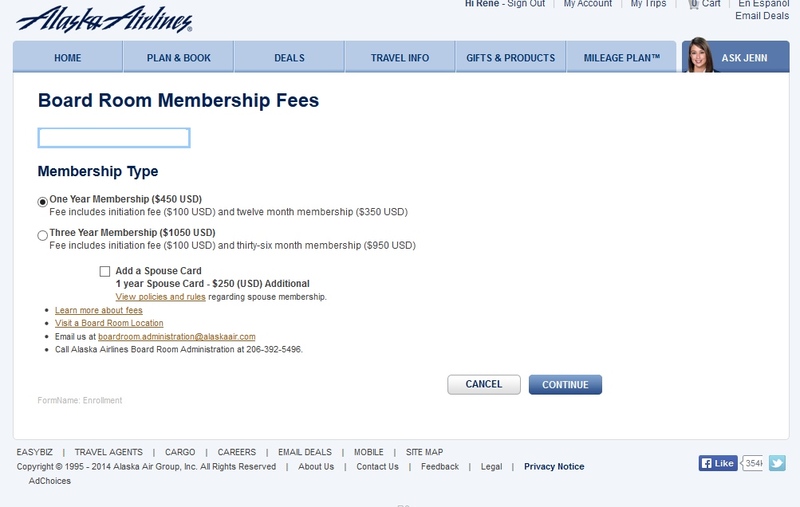 Is the 25 per visit offer using Delta amex still available? I called yesterday to see if I could get some perks to replace the loss of the Delta Amex Reserve guest access to the Skyclubs. The representative went away for a while, then came back and said nothing was being offered at this time to make up for the lost perk. I know I read that some people were offered miles etc. What did I do wrong? Somehow my previous comment relating a cautionary tale about last-minute changes to Board Room benefits didn’t make it, so I will try again. The Board Room previously allowed access to the Admiral’s Club locations in ORD with an Alaska or American boarding pass, but I discovered that they limited that to only Alaska boarding passes one day when I tried visiting. I wasn’t offered anything other than an apology and a promised that they would update the website… So I would suggest being careful about joining the Board Room for purposes of accessing SkyClubs, especially if you’re counting on the guest access privileges. @Anne – hang up, call back. Any thoughts on whether holding dual memberships (Diamond with Reserve card) will get a guest in? @Kevin – I have thought about that. In the past you could often work this as you had DM or even two Reserve cards and each got you two guests. Now, each card is JUST for you so doubt it. Hate to say the gate dragons will exert their $$$ not matter what starting 1MAY! Rene, does delta offer a refund of the yearly fee if you cancel before your year is up? I’m sure it doesn’t but wanted to know before I call and ask for something since I paid the fee in December and am only getting the +1 for 4 months. @Christine – often yes but YMMV. Call and see. @Confused – the rule change does not kick in till 1MAY2014. @Confused – no no Board Room at this point is NOT changing anything. This is all for Delta DM & Credit card holders. We will see if anything changes for Alaska down the road.